Markets managed to bounce back following last week’s sell-off. The gains were much stronger than the data should have otherwise justified, and it likely reflects some combination of investor relief over reports showing that the U.S. consumer is still optimistic and continuing to spend, while poor global data has shifted central banks to a more accommodative stance. U.S. retail sales managed to rebound slightly in January, helping ease concerns over last week’s lower than expected jobs number. Consumer and producer prices this week showed prices holding steady, while U.S. industrial production flashed signs of softness. There was not a lot to love in this week’s batch of reports, but that didn’t stop investors from bidding the S&P 500 up 2.89%. Retail sales rebounded in January, rising 0.20% to $504.4 billion. That was a reasonable turnaround from December’s downwardly revised -1.60% decline. Weather played havoc on autos and gas, and when excluded, the latest monthly data showed a much stronger core sales performance, up 1.20%. The January rise in retail sales was driven by a 2.60% increase in online-shopping as consumers scoped out the post-holiday shopping deals and a 3.30% rise in building material stores as consumers dug their way out from underneath the recent winter storms. Auto sales were down -2.40% for the month, which is their sharpest drop since January 2014. Given the global economic malaise and the drag on the manufacturing sector from the trade wars, the U.S. economy is being held together by the services sector, jobs and the U.S. consumer. The market needed a good number from January following last week’s poor job report, and while it required looking under the headline figure to find its strength, the market managed to see enough in the report to breathe a momentary sigh of relief. Inflation remained modest in February as consumer prices rose 0.20% month-to-month. That was the first increase in four months, driven by a rise in food, gasoline, and rents. Year-over-year (YOY), consumer prices were up 1.50% for their smallest annual gain in nearly 2-1/2 years. Excluding volatile items such as food and energy, core consumer prices rose 0.10%. Year-over-year, core consumer prices are up 2.10%, in line with the Federal Reserve’s 2.20% target. Producer prices, which are a gauge of business prices, rose 0.10% in February. Excluding food, energy, and trade services, core producer prices rose 2.30% from the year ago period. While the YOY figures for both CPI and PPI are in line with the Fed’s targets, the more recent trend is weakening, and that is likely to keep the Fed in a “wait and see” mode. They are more likely to be paying attention to overall U.S. production, which only rose 0.10% in February, while manufacturing itself declined -0.40%. Had it not been for the poor weather boosting utilities, the overall industrial production figure would likely have been negative. The headwinds facing manufacturing have been well noted, and manufacturing tends to be volatile from month to month, but February’s reading is the first back-to-back negative reading in nearly two years. With central banks now signaling their bias towards accommodation, investors have adopted a “bad news isn’t all that bad” attitude. Everyone has expected the deceleration in momentum that we’re now seeing and so long as a) the U.S. remains in a better position relative to Europe and China and b) the metrics into the health of the U.S. consumer remain strong, then investors seem comfortable betting that the economy can successfully idle back as long as rates remain low. This week’s data supports that narrative and it is likely to be the reason we saw the outsized move by the market on less than inspiring fundamentals. A big week for economic news as the Fed holds its Federal Open Market Committee meeting. Traders will also pour over reports on durable goods and existing home sales. There are just two days remaining until the teams competing in March Madness are announced. The day known as Selection Sunday will officially kick off the 2019 NCAA Division I men’s basketball championship tournament on March 17th. 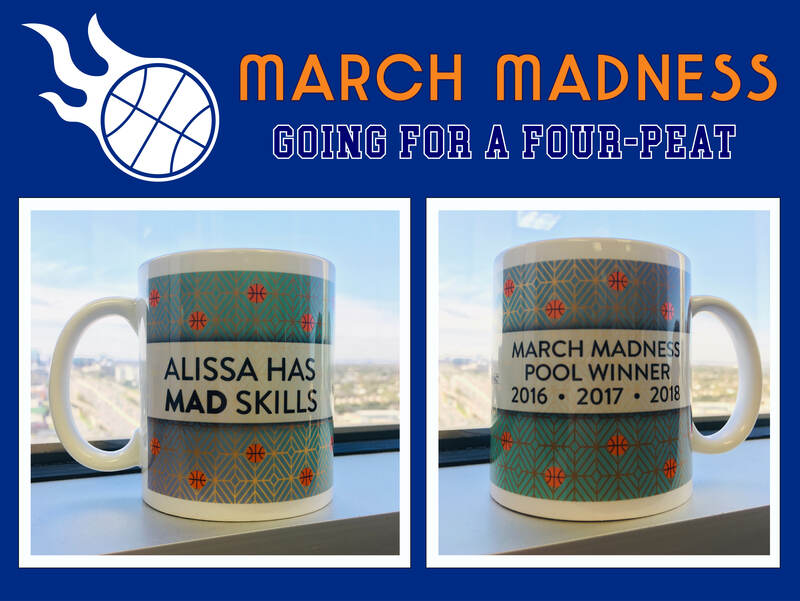 Probity’s own Alissa Kaiser will be defending her reigning bragging rights as winner of the Probity Advisors, Inc. office bracket challenge three years in a row. 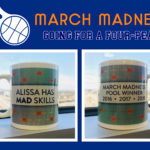 She is not only the three-time defending champion, she is also the winningest participant in our office pool’s 11-year history and has the coffee cup trophy to prove it. She won’t be sharing her bracket ahead of time (colleagues have asked) but is confident her picks will once again lead her to victory. Alissa says the secret to her successful bracketology is watching her favorite team and alma mater SMU play. The last time SMU made it to the tourney was in 2017, and they didn’t make it past the opening round. While her team may not make it to the dance this year, Alissa says the SMU mustangs play teams who have, and she is a regular at Mustang basketball games. More than 70 million Americans fill out a bracket each year. That’s almost a quarter of the population. Where did this madness get its start? The first NCAA bracket pool is thought to have originated in 1977 in a bar in New York. Roughly 80 people participated in the pool, filling out brackets with each contributing $10 to the pot in a winner-take-all format. By 2005 at that same bar, some 150,000 people entered the pool, and prize money exceeded $1.5 million. But, the tax man cometh. After 2005’s winner was identified as “Noe Body” and after a 2006 winner reported his winnings on his taxes, the IRS investigated. The bar’s owner nearly went to prison for tax evasion but instead netted probation and a termination to the maiden pool. All good things must come to an end, just hopefully not Alissa’s reign. The NCAA’s process for selecting, seeding, and bracketing each team is complex. It involves a committee of ten collegiate administrators from each of the four regions who are nominated to serve five-year terms. Committee members spend countless hours evaluating teams through observations, data analysis, and speaking with coaches. And there are rules to ensure fairness. Committee members cannot be in the room when teams from their conference are being discussed for inclusion, nor are they allowed to vote for them. Each committee member votes in secret. After teams are selected, the committee then seeds the teams ranging from 1 to 16. The best teams are given the 1 seed, and the worst teams a 16 seed. The opening games pit seeds against their opposite such that a 1 seed plays a 16 seed, a 2 seed plays a 15, etc. It is intended to achieve a competitive balance across the four regions of the championship. The odds of picking a perfect bracket are so small that mathematicians disagree on the actual estimate. Some believe it is as low as one in 9.2 quintillion while others believe it’s as high as 1 in 128 billion. One thing everyone can agree on is that correctly picking the winning team from all 63 games of March Madness is nearly impossible, and nobody has ever successfully filled out a perfect bracket. Alissa’s picks don’t have the be perfect to win, they just have to be better than everyone else’s. Good luck, Alissa.